SALEM TWP. — If there’s one thing a head coach wants to see from his program, it’s growth. 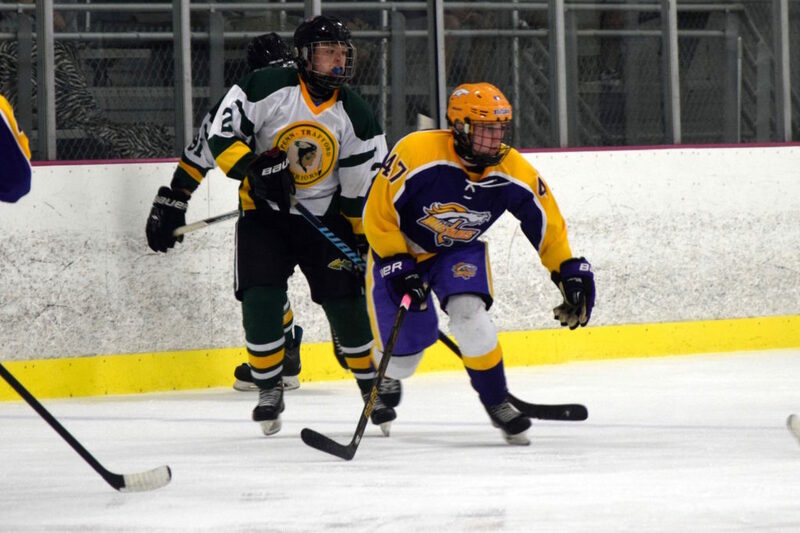 Now in his second year, Plum head coach Vinnie Somma has seen plenty of it as his Mustangs are now 3-0 and atop the PIHL Class AA Eastern Conference. Somma saw plenty of opportunity when he took over the reigns of his alma mater’s hockey club before the 2015-16 season. But it took a lot of work to get the team to where he needed it to be. The Mustangs started to make progress in Somma’s first campaign, but their postseason was cut short by a tough draw and a 3-2 loss to Mars in the first round of the Penguins Cup playoffs last year. This year, the Mustangs are off to an impressive start and Plum isn’t just winning, either. They’ve jumped all over their first three opponents, including a 6-1 drubbing of Penn-Trafford at Center Ice Arena Monday night. They also trounced Hempfield, 9-1, and avenged their loss to Mars with a 6-2 beating. They’ve scored 21 goals while allowing just four and have laid claim — along with fellow 3-0 club Hampton — to one of the top spots in the Eastern Conference. Make no mistake about it, the Mustangs are gunning for a championship. With 10 seniors on the roster, a balanced offense, strong defense and quality goaltending, Plum has all the ingredients of a championship club. Doing the biggest part to keep the goals out of the net is goaltender Sergio Benitez. Benitez is a full-time starter for the first time in his career, but with a 1.33 goals-against average and a .945 save percentage — second and third in the conference, respectively — he’s doing more than his fair share of the work on this upperclassman-laden team. While Benitez has been appreciative of the hard work his defense has done in keeping his crease clear and not “hanging him out to dry,” the offense of the team has been the real dynamo, in his eyes. Benitez and the Mustangs see their 3-0 run as not just a strong start to the season, but a portent of more positive things to come. Diplomatically, Somma took a more measured approach. The Mustangs will visit Greater Latrobe at Kirk S. Nevin Arena in Greensburg on Monday as they look to continue their winning ways. Face-off is scheduled for 7:15 p.m.